Frank, Bob D'Amico and myself discussed this off line, and thought it would be good to remember a surfcasting legend, or as Frank likes to say "A member of the Old Guard". I have a bunch of e-mails Al sent me with fishing tips, along with many others that show his sense of humor (some cant be posted here ), talks about his life, recent and back then. I'm not the most computer savvy guy around, so I might need Bob and Frank's help to get them posted One way or the other, they will get here somehow. Protocols are tossed out the window here. If you have something you want to share, please do so. Many here knew Al much better than I. But I had the chance to get to know how he operated back in the day on Cape Cod. When we got to P-town in 1970, we noticed that the beach fishing was carried on by a bunch of New York surfcasters -- really the only ones who fished it right. There were practically no locals fishing the beach -- two, Conrad and George DeRosa. Other locals by then had gone to boat fishing. A few Mass guys like George Carlizon and a gaggle of Thundermist Striper Club guys from RI who stayed in campers and religiously fished the Second Rip. The real surfmen were the New York bunch. And they, apparently to share the cost of travel, or to provide security, fished in groups. The one exception was Al, who, from my vantage, was nearly always alone. I had heard a lot about Al Bentsen because he was apparently viewed as some sort of high-liner. One soon learned that this guy was so prominent with the others that if he drank Pepsi, they would drink it too. Big deal, I thought. I also learned that he had to come out of step with the other New York guys or he was followed mercilessly. The others came on the Full moon and Al came on the New or dark moon for the simple peace that is supposed to be in surfcasting. What moved me most about him was that, unlike so many others, he didn't need an entourage to get around. I related strongly to his methods because I have always been a loner also. The New Yorker that I got to know first was Tom Murphy-- who we lost just last month -- who was also a loner. Murphy was always talking about Bentsen like he was some kind of folk hero. Big deal. It never occurred to me that Murphy's idol and the dark moon guy were one in the same until way later, maybe years. A lot of us didn't want any friends because relationships caused obligations over the fishing and there were too many trying to trade good grain for oats that had already been through the horse and with so many of you from Jersey or Long Island, you have to know what that is. I got to know Al very slowly during mid-watch hunts on the dark moons. He fished a black Harnell, approached with headlights out, said little, came alone, minded his own business, and hid his rigged eels like they were some kind of precious material. Murphy had said that this guy was the inventor or originator of the eel fished dead and I was beginning to put two and two together. I'll come back to this. I think I overloaded Frank's mail box with some of the stuff Al sent me. I'm too dumb to figure out how to post them here. Some are mundane things, but some are true golden nuggets. I think all will learn something from them. 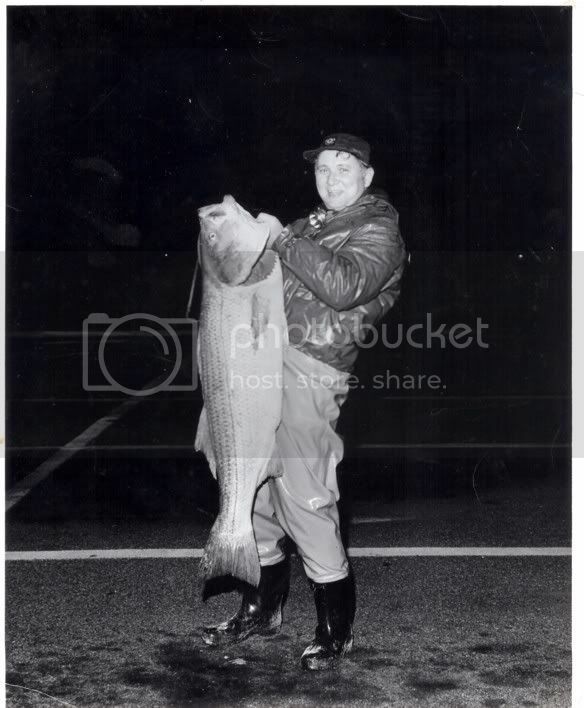 Al Bentsen with a 51.8 pound huge cow Striped Bass caught at Point Lookout 10/15/73 on a rigged eel. I think this tribute is a terrific idea and I'm looking forward to seeing the results. I wish I had something to contribute. My only personal encounter with Al was at a talk that he gave at one of the Fisherman seminars about 15 years ago. I should really honor his memory by finally getting around to fishing a rigged eel. Maybe, with the permission of Al's family, all these tributes, emails and pictures could be compiled into a book, with proceeds going toward a favorite charity or cause of Al's. I'm sure that would be alot of work, but many of us would love to have a "hard copy" to refer to at any time. Just a thought. Rest in Peace, Al. My condolences and prayers to his family. I did a lot of bunker chunk in fishing in the fall of the early 70's. There were some important thing I learned for south shore fishing on Long that would probably apply to New Jersey beaches and the clams you use for bait. You may already know them. I still use them as guidelines when I fish bait now. Remember I only fish mostly at night. If you want to know what I learned let me know. The same guidelines should work in the daytime. Nothing is more offensive to a sneak than being another sneak. We sneaks learn not to trust anybody and I knew Al Bentsen had to be watched. For instance, here is the guy who all but invented the rigged eel but he fished an Atom plug every time he showed at the Second Rip. Who did he think he was kiddin'? I was sure he was fishing a rigged eel when nobody was looking then allowed himself to be seen with an Atom plug. Anyway, this morning at dawn, Atom plugs all over his gear, he had about a 35 pounder laying in the sand next to his Wagooneer. The old eel/plug switch trick. Worse, nobody had a single take in the 20 regulars fishing the rip. But he didn't fool me. Anyway, 35 years later he told everybody, me last, that he had caught it on the Back Beach and wanted us all, at the time, to think it was taken in the Second Rip. So his slight of hand was not in using a rigged eel. Rather, it was where he caught the bass. That buggah! When I started fishing with him, he told me that if he took a "lesser fisherman" out then it was their job to carry his fish for him. I told him I would if he outfished me and fortunatly that didn't happen too often. One night though (late October 1978) he called me over to unhook the only fish either of us had that night, basically to rub my nose in it because it was such tough pickings and the wind was in our faces (not easy to cast a riggie on conventional into a 25 mph breeze) , he knew we wouldn't fish much longer that night. He had that 9/0 hook buried to the hilt in solid bone of a nice 47 pounder and he said his hands were too cold to deal with it so I worked on it for quite awhile with pliers and muscle and finally got some play in the hook and was able to eventually work the thing out. I must have unhooked over 20,000 bass in my days (no exaggeration) and that one was by far the most solidly hooked fish I've ever seen! I was in Causeway B & T in Wantagh LI yesterday morning for a few minutes. In that short time I heard Al's name mentioned by three guys. In an area with many thousands of people (and probably thousands of fishermen too) to hear his name randomly as I was passing through told me he won't be forgotten. I never knew him or met him, but my condolences to all who did...I'm sorry for your loss. I think that what you posted is a tribute to Al in itself. Though we never met in person, the stuff we shared through e-mail, phone calls and such was special to me. I'm sure if you were lucky enough to fish with him, as Frank and several others here were, it probably cuts deeper than it does me. One thing that pops into my mind was when he directed me to the StriperSurf club link. I got to see him as a "kid", then as a mature guy. Other than the get older thing, he looks the same. Same smile on his face holding a 50 pounder in his 20's, as when joining friends for dinner in his 70's. its always sad to see one of the old guard gone,i fished the same sand and rock piles that he did, when i lived in new york. rest in peace al. The rigor of the time was to fish the Back Beach on the incoming after dark and follow up on the dropping tide at the Second Rip which is about halfway from the Coast Guard Station (now the Gestapo Headquarters) and the Race Light. Best tide was when the water was pulling east, left to right, at dawn. One morning when it was like that the bluefish came in with their pants down. These were never considered money fish -- our reason for being -- but at the time many of us, me included, had never seen such bluefish monsters, what had become known as "African Blues". A child could see their progress as they blew up the sea out front, dropping down toward the back. Al was in his Wagoneer chasing them and I put the kitchen pans in the sink and drove the big camper buggy after Al and the blues, wife and kids all wondering what ta heck I was doing moving the big rig. By the time I caught up Al had put a few jumbos in the buggy and was fighting one. These were all over 16 pounds, some lady on the Back Beach had taken a 23 pounder and we were hearing about others over twenty. Back then the World Record was only 24 change, so beating it was doable. I was horsed. All were throwing Reverse Atoms, I could tell, because they whistled when you layed into them. There I was fishing my a$$ off, Al hooking up every cast and I couldn't get arrested. I wanted to puke. I was crowding him, trying to see what he was doing bein' as how he caught every cast and I failed every cast. He could sense my frustration and called over, "put a bucktail on that Reverse." Now, I'm at the valise of my buggy with pliers bending on a bucktail treble with the shakes and Al is leaning into another one, a flippin' African blue. (my takin' too long with this?) So I runs out with my magical Reverse, roadkill white hair on the rear treble, and lays into it. Three pops, five turns on the Squidder, and I was on too. He looked over like a proud father, grinning with delight. I wanted to kiss that freakin New York sonofabitch. By God, I felt sorry for those bluefish; I really did. Tomorrow, or next time, I'll tell you something about compliments, considering the source with Al Bentsen. For the past 15 years, I was Al's fishing partner. We spoke at least once a day on the phone. We lived only three blocks from each other. He would walk his dog past my house every day and stop and chat. He opened each conversation on the phone or face to face the same way: "Hear anything?" We both had friends who would funnel us info and Al and I would use what we heard to figure out what we were going to do that night. We did not always fish together. Often we would split up trying to find the fish. As his health failed, he often opted to go with me out of fear that something would happen to him if he were alone and no one would be there to help him. One night he cut his hand and we could not stop the bleeding since he was on a strong blood thinner. We were into fish, but we packed it in and sped home. He was so creative. He developed a new way to rig eels. He had old molds going back 50 years so I bought 20 lbs of pure block tin on eBay and we poured a bunch of tins. We sewed pieces of pork skin into "eels" and hung them on one of the tins. When the blues tore up our real eels, we would switch to pork rind eels and hook them. He was always thinking of new ways to fool the fish. At one point, the police were giving out tickets and towing cars parked on the grass near the bridges. My wife volunteered to taxi us to the bridges and pick us up when we called on our cell phone. Al said she was a saint! She is. I miss him a great deal. Not a day goes by that I don't think of him. Though I never met Al face to face, our e-mails and phone conversations were about the same. Though he hadn't fished Jersey in many years, he always wanted to know what was going on down here, especially early spring and mid fall (checking the barometer of striper fishing)? I always liked the ones in fall when he said they were getting them good up in NY, and it would be a short time before they hit Jersey.